The brunch menu has standard breakfast items like Eggs Benedict ($13), poached eggs on english muffin with ham & hollandaise suace – American Breakfast ($18) with eggs, sausages, beans, mushrooms, bacons, tomato & toast – Omelette ($10) with choice of cheese, ham, tomato – pancakes ($10) with maple syrup. If breakfast food is not your thing, there’s also a variety of sandwiches and main courses available on the menu. We were thinking about the desserts at Laurent Bernard’s, so for once, there wasn’t much room for the eggs at eM by the river. Rich and thick hollandaise sauce drizzled over the delicate poached eggs, accompanied by thinly-sliced smoked salmon on a toasted English muffin (unfortunately it’s a little soggy) — but still, there’s just something amazing about having the Eggs Royale ($14) for breakfast. eM by the River has a 1-for-1 happy hour on Mojito during Saturday night (9pm to 11pm). Sitting beside the river and having mojito while staring at the stars above, it’s the perfect way to spend the night. Now that I have been to eM by the River, I think they are a good alternative breakfast place if the queue at Epicurious cafe is too long. Besides, they serve daily brunch while epicurious only has weekend brunch. If you are in the mood for pasta or pizza, check out Bella Pizza which in my opinion, is one of the best pizza places in Singapore. For desserts after your meal, drop by Laurent Bernard, or Canele Patisserie. Among the many restaurants at Robertson Quay, I’m very much tempted to try Brussels Sprouts, as well as Satsuma Shochu Dining Bar at the Gallery Hotel next. How about you? Which is your favorite Robertson Quay Restaurant? You missed out on the best part – only S$6 for a Bloody Mary (at least on the weekends)! 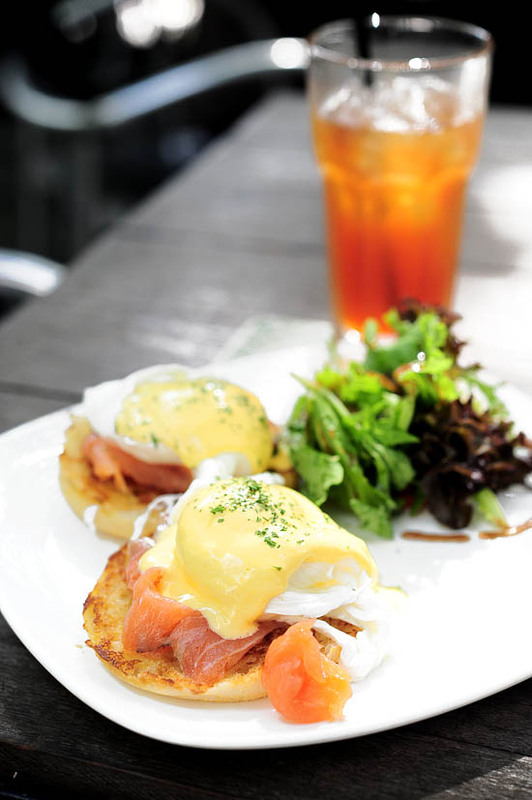 There is no better hangover cure than a plate of Eggs Benedict and a Bloody Mary. The owner of Bella Pizza has opened Bella Pasta around the corner but I haven’t had a chance to pay a visit yet. Beautiful photos, mate. Nothing like a lazy Sunday breakfast (even if it’s neither a Sunday nor properly morning, as it were). em by the river serves great brunch. good review and recommedations! its one of the best outdoor bar/restaurant in my opinion..
My family and I brought my parents to em by River to celebrate mother’s day . We had a good time at the restaurant until I discovered I left my handphone behind after I reached home. I called up the restaurant and I am very disappointed when the staff told me they didn’t see my lost phone. The restaurant was not packed on. Sunday night and I am sure the staff was not honest enough. Went there for the first time couple of years ago..and came back cause i liked the food and ambience..Actually recommended to a lot of my friends. On the 2nd visit, service was horrendous! A rude assistant manager: was enquiring for my food (that havent showed up after a long while), asking if he can go and check..and he said “you can go to the kitchen, but it will be useless”..and then manager came and said “Sorry, he’s French”??!! Came back again couple of months later..again, bad service..waited long for the waitress and they arent friendly at all. Decided not to go there ever again..